KM supports decision making, but which decisions? There is a strong argument that the purpose of Knowledge Management is decision support. But which decisions should KM support? Peter Senge tells us that Knowledge is the ability to make effective decisions, and the new ISO standard 30401:2018 tells us that knowledge is “human or organizational asset enabling effective decisions and action in context”. By giving staff access to knowledge, we allow them to make better decisions, leading to fewer mistakes, less rework, and more efficient and effective organisations. 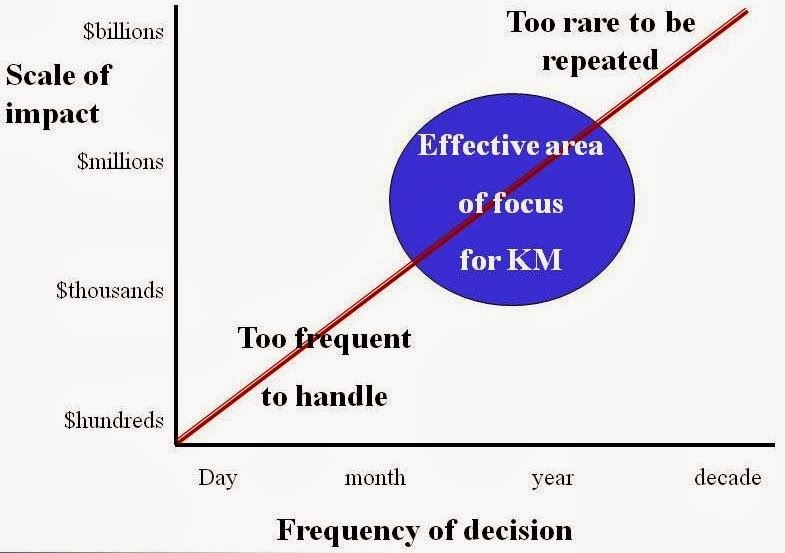 So if we want to improve the effectiveness of decision making in our organisations, then we look to KM to help us, and Km can be implemented by targeting a range of decision-related business issues. But which decisions? Any organisation makes a whole range of decisions with a whole range of impact – from small decisions every hour or every day within an impact in the $100 region, such as sales decisions to a customer, up to massive billion-dollar decisions every 10 years, such as major investment decisions, or decisions related to mergers and acquisitions. When we start our KM journey, which are the decisions which it is most cost-effective for KM to support? Firstly, there is no point in supporting the tiny daily decisions, which have an impact in the $100 dollar range. There are too many of these to be able to handle them easily, and the amount of KM investment is likely to be high. We can tackle these later, through the development of guidance and procedures. Secondly, there is no point in trying to support the very rare decisions that happen once a decade or so (decisions about major acquisitions or divestment, or decisions about complete reversals of strategy). You could do a lot of good KM work on these decisions, but it would be ten years before that knowledge was re-used, so you will not see the immediate impact that you will need in teh early days of KM. The ideal place to focus is in the middle – the decisions that are worth millions, and are made on an annual basis. Here the value of KM will be high, and the re-use of the knowledge will be relatively frequent, and a year is about long enough for people to have forgotten the details of the last decision, and to start to reinvent the wheel unless KM helps them. These medium value,. medium frequency decisions are a great place to start, as they allow you to deliver significant value through KM in a timescale which is short enough to drive KM forward.